A more than mysterious band here; The Sedgwicks were, as far as I can tell, from Kent, released two singles in 1992 or possibly 1993 and disappeared without trace. 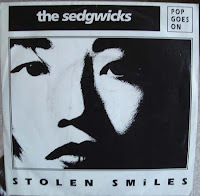 Having said that of course, I can only find any trace of the Stolen Smiles EP that this track, the eponymous The Sedgwicks - Stolen Smiles comes from. It's a cracking bit of jingly-jangly and I'd love to know more about the band, so sorry this is a bit short, i'm kind of hoping anyone who stumbles across this knows more than the internet does; plus it's been a hectic month and I've not had the time to sit down and do anything that passes for research! Not much comes out of Glossop (except for Stuart Hall and Shaun Ryder of course), so it's nice that we can visit there today with The Bodines. "The Bodines emerged from Glossop in Derbyshire. Fronted by the floppy-fringed Michael Ryan, they became one of the better-known outfits from a crop of jangly indie bands that sprang up around that time... The group's debut album, 'Played' (produced by Ian Broudie, later to enjoy success as a recording artist as the Lightning Seeds) was a fine jangly pop artifact, but it only scraped in to no. 94 in the album charts, in the summer of 1987. " And there's Ian Broudie again. He gets everywhere. The wiki page and Indie mp3 page have loads more stuff, so go and enjoy there. 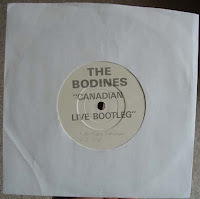 This particular mp3, The Bodines - William Shatner is taken from a Canadian live bootleg 7" single, which is worth a mention alone. Firstly apolgies. This isn't a post about an indie band and it's not mine. It is however, a work of genius from the mind of MJ Hibbett, the man who previously unleashed "hey, hey 16k" on the world. Even better, if you go here you can buy the song on 7" vinyl. I would. Well, I have. Normal service will be resumed soon. Promise. Probably with The Bodines. Once more into the London-based world of swooping, swirling indie rock today with Th' Faith Healers, a rather good band that plied their trade on the indie circuit from (probably) 1990 to 1994; and jolly good they were too, despite what is universally considerd to be an unhealthy fixation with Krautrock. The band were really good live, produced some belting singles and almost had a crack at the really big time (not least as they supported The Breeders on a US tour) but unfortunately never really converted fanbase and critical success into the commercial fame they probably deserved before splitting. They re-formed in the early 2000s for one more crack at the big time, but apart from a short tour and a couple of re-releases, they've not really been seen since 2006, so they are ripe for a mention here. The All Music Guide tells you most of what you'll need to know and this is a really good Faith Healers fan site which fills in a lot of gaps, so again I'll not copy left, right and center and suggest you pop over there for a read. Oh, and of course the band have, as is fashionable, one of those new-fangled Myspace pages for even more. 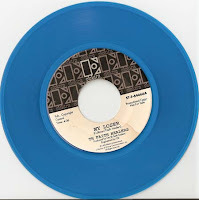 Here you go, have Th' Faith Healers - My Loser, an only available in the US on blue vinyl limited edition 7" and everything. Time for some spring cleaning of the indie notebook I carry around in my dapper manbag. I've been meaning to put Pop Will Eat Itself on here for ages, but keep getting side-tracked by obscurities and bands I'm only just discovering; so it's nice to finally get round to putting on a band I really used to like. I do keep forgetting that some of these bands, although they're "famous" to me and most of the people that read this page, there are still people that have never heard of them. Poor people. So, another bunch of West Midlands scamps, cut from the same cloth as Ned's Atomic Dustbin, The Wonderstuff and the Senseless things to name but a few, PWEI were probably one of the most prolific and well known of the early 1990s indie bands; they knocked out singles and albums at an incredible rate and, along with CUD and Carter, were probably one of the most recognisable and critically acclaimed bands of the time. You knew where you stood with PWEI, if one of their records came on in a club then everyone would be up and dancing and you knew that when the NME had a photo of Cint Mansell on you were going to get a good story. You knew that you were going to get a good show if you went to see them live and by crikey you knew a single was going to be a good shouty sing-a-long of a bit of vinyl. 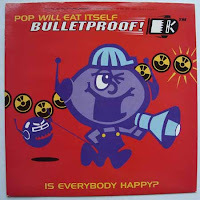 You can buy Pop Will Eat Itself's best of "PWEI Product 1986-1994: The Pop Will Eat Itself Anthology" by clicking here. You really should. Ah well. 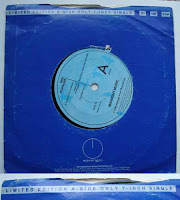 Instead, why not have another of Brighton's jingly-jangly massive, yes it's The Popguns ladies and gentlemen, and here recorded from the lovely one-sided promo pictured; always the best way to hear a piece of indie pop if a flexi disk is not readily available. The Popguns score several points on the "How Indie Are You?" Facebook application of life. Not only are they from the aforementioned Sussex seaside indie wonderland, but they had a lady singer and, get this, the ex-drummer from the Wedding Present; one Shaun Charman. Marvellous stuff. The wikipedia page is a little sparse and their 'official' page hasn't been updated since 2003, but we do know that they banged out a load of cracking singles and albums (discography here), bashed around from 1988 to 1996 and made the Festive 50 at least once (certainly 1989 with Landslide) and certainly had a touch of the Wedding Present about them. OK, they might not have had David Gedge's angst down, but they certainly had lyrics that were deeper then you might have thought from first listen. So this is The Popguns - waiting for the Winter; the height of twee. Lovely stuff.